Take “The Thirty-Fathom Grave,” for example. It’s a story about a modern Navy ship discovering a sunken World War II submarine — and hearing a mysterious tapping sound coming from inside. 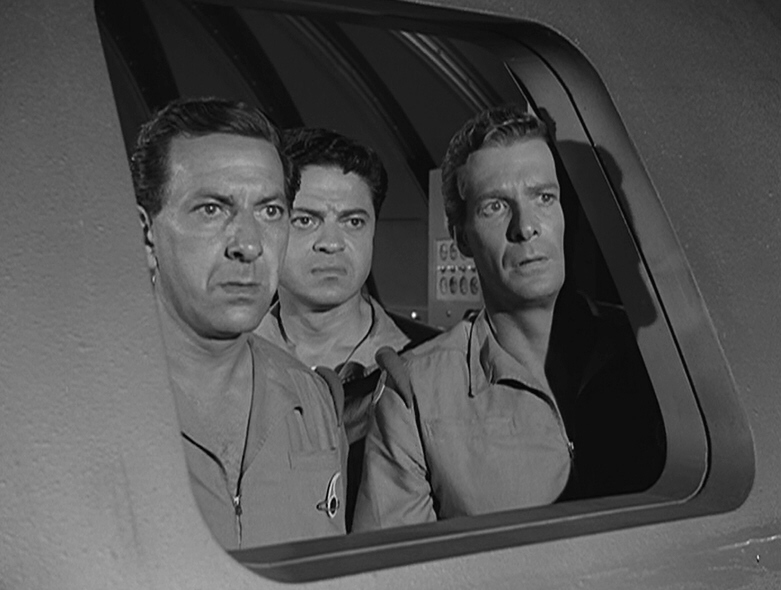 For the sake of those who haven’t seen it, I won’t ruin the ending, but suffice it to say that the story, despite the usual quality touches you’d expect on a TZ, is simply too padded. Several other Season 4 episodes were also stretched out a bit too long. 1) In His Image: A man who keeps hearing strange voices in his head travels to his hometown and finds things are not exactly the way he remembers them. Then he meets his “inventor,” a man whose boyhood dream was to create a perfect artificial replica of himself. Again, I won’t spoil the ending for those who haven’t seen it, but it’s an absorbing tale from Charles Beaumont, the writer who gave us “The Howling Man” and “Perchance to Dream,” among many other TZ classics. 2) Jess-Belle: If you’re a woman, and the man you love is about to get married to someone else, how would you handle it? Jess-Belle (played by the beautiful Anne Francis) didn’t take it lying down: She went to the local witch and found a way to steal him back. Happy ending for all? Not quite. Earl Hamner Jr. (who later created “The Waltons”) crafts a well-paced tale about getting more than you bargained for, not to mention which curses are permanent and which ones aren’t. 3) Death Ship: Three astronauts land on a remote planet (in 1997!) and see a startling sight: a crashed space ship that looks just like theirs. That’s bad enough, but then they start exploring — and find three dead bodies that, yes, resemble theirs perfectly. The incomparable Richard Matheson, who also wrote “Nightmare at 20,000 Feet” and several other great TZs, sketches an intriguing mystery, as the astronauts try to find out what in the world is going on. 4) On Thursday We Leave For Home: A group from Earth has tried for years to set up a successful colony on a desert planet, to no avail. The only person who’s kept them alive is Captain William Benteen, the group leader. So when a ship from Earth arrives to take them home, they’re ecstatic. So is Benteen, at least at first. Gradually, though, he finds it’s not easy to give up control. 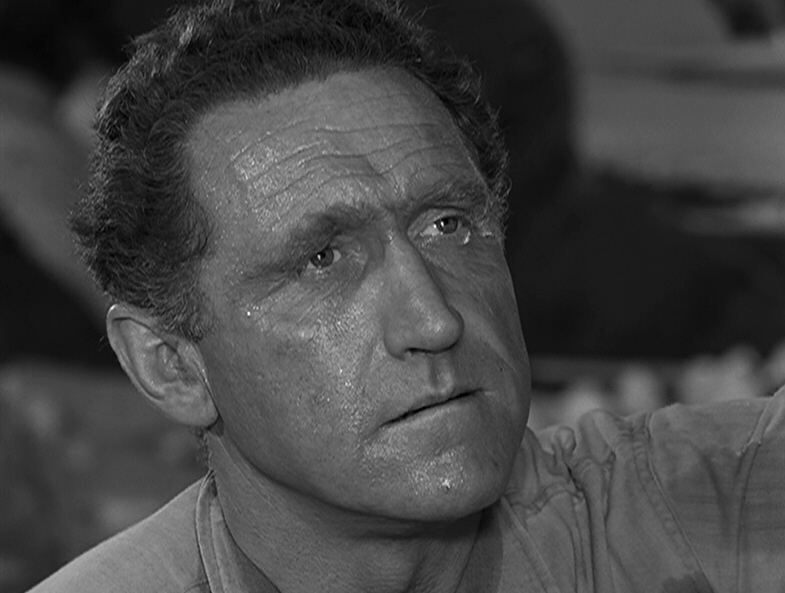 A fascinating study of the use and misuse of power from Serling. Honorable mention also goes to “Printer’s Devil,” with Burgess Meredith doing his usual charismatic work as, well, the Devil; and to “The New Exhibit,” a Psycho-type story about a man acting as caretaker for a group of wax figures portraying famous murderers in history. Most of the other episodes aren’t as strong, but they’re rarely bad, of course. They suffer only when measured against the usual excellence we expect on The Twilight Zone. For now, Season 4 is not on Netflix streaming. Season 4 is available on DVD and on Blu-ray (both of which can be rented from Netflix) and on iTunes. Or you can watch it (with commercials) on Hulu. 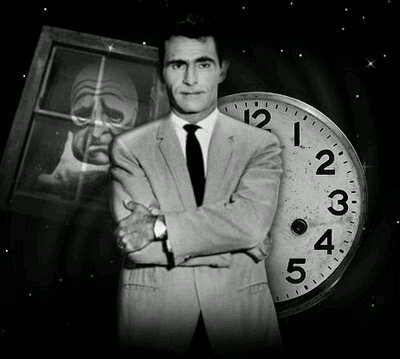 One final distinction: Season 4 gave us the famous Twilight Zone opening with the clock, the shattering window, the door, the “E=mc2,” etc. Serling apparently liked it; the credits had changed repeatedly throughout the show’s run (Season 1 is my favorite), but it retained this look throughout the last two seasons of the show. Season 4 may have failed to live up to the very high standards of Seasons 1-3, but it still gave us several memorable episodes. 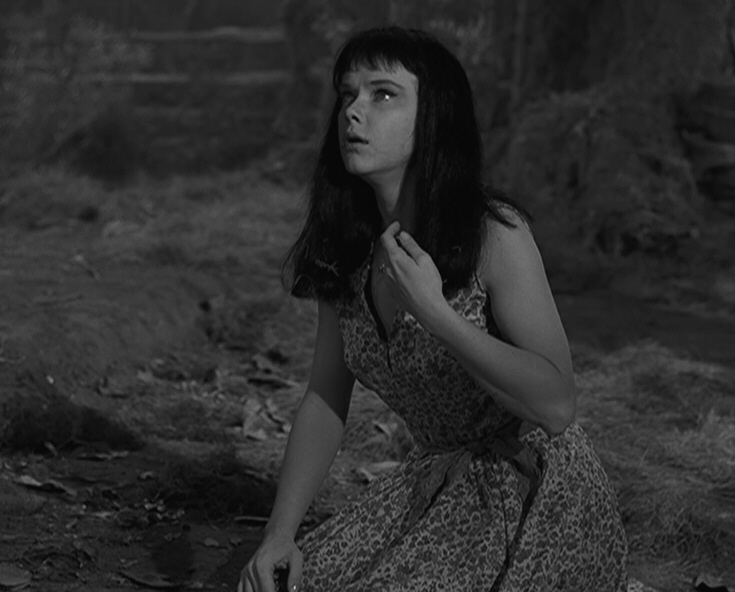 Posted on 05/31/2012, in Twilight Zone and tagged Anne Francis, Burgess Meredith, Charles Beaumont, Death Ship, In His Image, Jess-Belle, On Thursday We Leave for Home, Richard Matheson, Rod Serling, Twilight Zone. Bookmark the permalink. 20 Comments. Oops, the above comment of mine was meant for the theme…but as to the rest of the post, I did notice that and had always wondered about the extended format. Abosolutely right, it makes a big difference! It was an experiment that didn’t work, but an interesting one nonetheless. Charles Beaumont in particular did some very fine work that season. 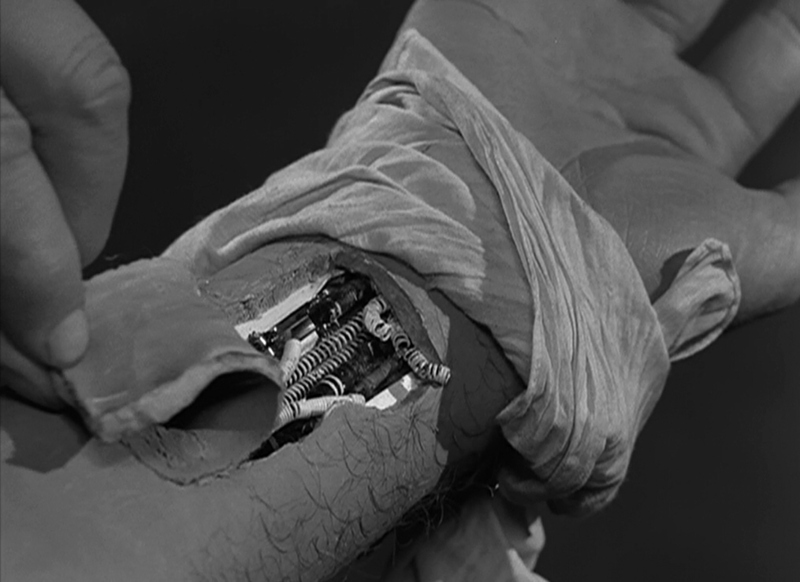 In His Image was the first TZ episode I ever saw & has remained a favourite. Needless to say, it didn’t stop there! I know what you mean. You can’t visit the fifth dimension only once. Return trips are necessary! Thanks, Michael, for stopping by. Wonderful web site. Plenty of helpful information here. I am sending it to several friends. And certainly, thanks in your effort! I’m glad you like it. It’s a true labor of love. Thanks for spreading the word! Maybe this explains why the 1-hour episodes usually air between midnight and 6:00 am during SyFy marathon (not that I haven’t watched them). Some are quite good. Also, in fairness to networks, this was still the early days of television. Although, in 50 years they haven’t come up with something as good, so maybe there’s no need to be fair to the networks. Ha! Well, Serling gave them hell, so I have no doubt they deserved it! There’s no question that the perfect TZ is half an hour, not an hour, but they did manage to tell some very entertaining stories anyway. Ones that should be aired in prime time, if you ask me! Glad you enjoyed it! “On Thursday” was a definite high point of Season 4.